USA, 1976/2010. Director: Duke Mitchell. Duke Mitchell, Jim LoBianco, Peter Milo, Lorenzo Dardado, Jeanne Hibbard. Executive Producers: Sage Stallone and Bob Murawski. 83 Mins. Watch the GONE WITH THE POPE trailer! 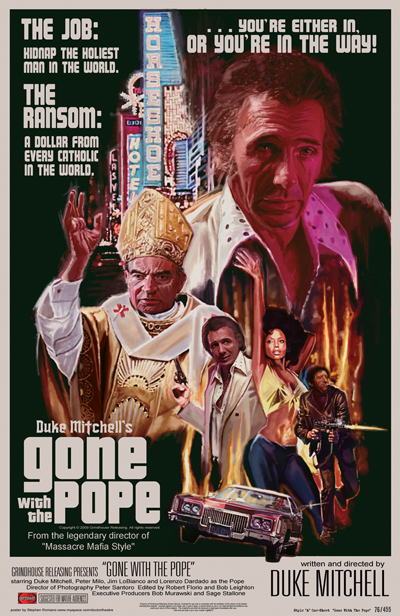 “I could try to describe the plot of Duke Mitchell’s posthumous exploitation thriller “Gone With The Pope,” but the movie poster really says it best. The Job: Kidnap the Holiest man in the world. The Ransom: A Dollar from every Catholic in the world. …You’re either in, or you’re in the way!” The tag line also serves as a perfect disclaimer. You either want to see a movie called “Gone With the Pope,” or you don’t. I definitely did, and I joined a packed house at the American Cinematheque on Friday night for a World Premiere that was nearly 35 years in the making. None of this makes Duke Mitchell seem like a likely candidate to direct such a far out film as “Gone With the Pope,” but one of the film’s strengths is in the way it showcases Mitchell’s larger than life persona. Whether he’s charting a yacht trip across the world, lighting two cigarettes at once, or showering one of his victims with a handful of unspent bullets, Duke Mitchell owns every frame of the film he appears in. It’s hard to say how much of what Mitchell does in the movie is acting, or just being himself, but it hardly matters. His presence is commanding, and as a director Duke was smart enough to know it. The movie is also surprisingly beautiful to look at. According to the cast and crew who were present at Friday’s screening (among them Peter Santoro, the film’s cinematographer and Jeffrey Mitchell, Duke’s son) the movie was shot all guerilla style, using almost exclusively 35mm short ends. For a film with next to no budget, Mitchell and crew managed to shoot in a lot of different locations, all of which come off looking fantastic. In addition to Los Angeles, the film features sequences shot in Las Vegas, Lake Arrowhead, and even Rome (4th unit, according to the credits). The 35 mm shots of Mitchell walking in slow motion in front of the now defunct Stardust hotel at the height of its neon 70’s splendor are reason enough to have preserved this film. It’s also ridiculously entertaining. The story of how Gone With The Pope came to be unspooling at the Egyptian on Friday after 35 years is almost as crazy as the movie itself. Bob Murawski, who co-owns Grindhouse Releasing with Sage Stallone, ended up watching Massacre Mafia Style, Mitchell’s previous film, and loving it. 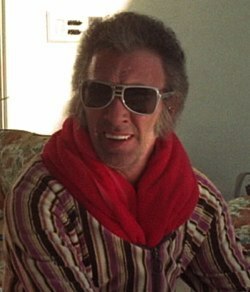 Wanting more of the unique Duke Mitchell style, he set out on a quest only to discover that Duke had died in 1981. Then [Stallone and Murawski] discovered that Duke’s son Jeffrey only lived a block away, which led to a discussion of Mitchell’s work. It was at that point that Jeffrey made Murawski aware of the existence of Gone with the Pope. Seventeen reels had been shot, and a rough assembly of the movie put together, but Duke had died before he had a chance to finish it. Sensing a kindred spirit, he handed the reels over to Murawski, who embarked on a journey to complete the film. Fast forward 15 years, and Gone with the Pope and Bob Murawski are having quite a week. On Sunday night, he won his first Academy Award for editing The Hurt Locker, and on Friday he finally got to see Duke Mitchell kidnap the Pope on the big screen. We are working on the home video releases of Duke Mitchell’s GONE WITH THE POPE and MASSACRE MAFIA STYLE. We will announce the details and release dates here when they are firmly set. We know it has been a long wait, but Duke Mitchell’s films are worth it. Visit www.GoneWithThePope.com and GrindhouseReleasing.com for updates coming soon! So freaking excited; my most eagerly anticipated release for literally years (ever since that unbelievable trailer was released). I’m sure the wait will be worth it! Very much looking forward to picking up blu-rays of both Massacre Mafia Style and Gone With The Pope. I loved both movies when I got to see them, especially Gone With The Pope when it was on tour in 2010. Great memory. AAAAAAH! I can’t stand it! I gotta see this movie! The anxiety and anticipation is tearing me apart. I understand that this is a very special project and you want to make sure it gets the proper treatment it deserves, so do what you have to do and I’ll pace back and forth until you’re ready to present it to us. Any updates along the way will be greatly appreciated. I own the double DVD set of Massacre Mafia Style that was released by Duke’s son, but I still plan on buying the Grindhouse release whenever it drops. I’m sure it’s gonna look beautiful. I personally hope to see Gone With The Pope released first because I just want to see it! The trailer is amazing and I know Grindhouse puts their heart and soul into all their releases. So thanks a million, Grindhouse, and now the pressure is on. Goddamn! Can’t wait to see this again. The blu-ray I’m most anticipating. Hell, you guys put it out on laser disc only and I’d run out to buy a laser disc player just to see it again. You guys did a tremendous job putting together this film, it deserves a larger audience than the few who were able to get into the sold out showings.